Whether the Government of India keeps in mind, the billion of residents when drafting the budget seems to be the central question. It’s very clear that the Budget has tremendous impact on how decisions are made by everyone. But what’s not clear is the feedback of the Aam Aadmi after a Budget is filed. Asking opinions from a panel of economic experts doesn’t reflect in any way what the common man thinks. It is not surprising that ShareChat, with its reach in every nook and corner of the country, is the ideal platform to discern the opinion of the common man. Following this line of thought, we ran three polls on our platform to judge the mood of the nation. As it can be seen from the above histogram, the budget received the most favourable rating from the people of Punjab. The main reason could be hiking the minimum support prices(MSP)to 1.5 times the production costs onKharif. This obviously resonates well with the people of Punjab, which is a highly agrarian based economy. Around 20% of Telugu users, which is the highest, were unhappy as they feel neglected as their demand of special status was not fulfilled. More than 50% of Hindi, Marathi, Gujarati, Punjabi and Bengali users gave high ratings of 8–10. The average rating of the budget is 7. The low ratings could have also come from the middle class as there were no changes in the income tax slabs. So they were left disappointed as they look forward to every budget to see if they can take home, a chunk of their hard-earned money. It is quite apparent from the above graph that Punjab, which also had the highest percentage of users giving favourable rating points to the govt budget, also had the most percentage of people believing that this budget will bring an immediate positive difference in the lives of the common man. 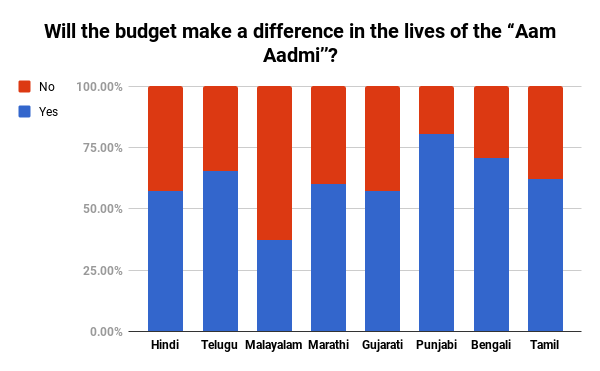 However, a majority of Malayalam speakers(62%) believed that this budget would not have any immediate impact on their daily life. As expected, 36.5% of the users, mostly salaried people wanted the apex government to focus on income tax slab revision. However, the standard deduction which was re-introduced at ₹40,000/- per year provided some consolation. The demand to focus on Entrepreneurs and Start-ups received the most vocal support from Marathi users, which bodes well with its already industrialised status. Interestingly, it also wants the most intervention on food and safety. 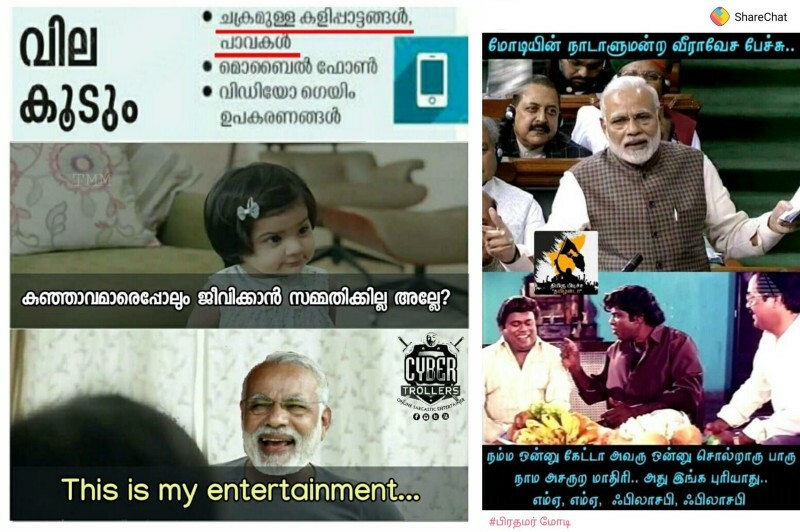 Malayalam community which is highly lauded for it’s highly performing social indicators, wants the govt. to continue to divert its attention to food and safety. As India has a greater share of young and dynamic people, they are more likely to be attracted by the spirit of entrepreneurship, which is reflected well in our polls as 21% of people wanted the govt. to focus more on these areas because the impacts can lead to better living for everyone in the society. To summarise, with the elections around the corner, the Budget of 2018 has been well received by the Aam Aadmi. In fact, more than 60% of ShareChat users feel it’ll make a positive impact in their lives. Here’s some of the posts about 2018 Budget that were trending. Note: The polls were conducted on ShareChat users, and received more than 1,00,000 responses that serve as representative of the entire user base. The participants of the poll were randomly selected to observe unbiased results.